On this date in 1939, a couple of “New Bolsheviks” recently flying high after helping purge the Old Bolsheviks had their own reversals of fate culminate with a bullet to the head. Stanislav Kosior* (or Kossior), a Pole who ran the Ukrainian Communist Party for much of the 1930’s, and Vlas Chubar, a Ukrainian politburo member who had once served as Prime Minister, were shot this day along with Pavel Postyshev,** once Stalin’s personal representative to the Ukraine. Left to right: Kosior, Chubar, and Postyshev — the first and last on post-rehabilitation Soviet stamps. Though these obviously died because of parochial party politics under the terrifying reign of Stalin — and all were accordingly rehabilitated after Stalin’s death — posterity has another bone to pick with them: the Ukrainian famine known as the Holodomor. Their portfolios included carrying out the forced collectivization to which the famine is generally attributed. Participation was strongly encouraged. there is an account of a case in the Ukraine in which fifty students were charged with forming an organization to assassinate Kossior, who had been named as one of the senior intended victims in the great Moscow Trials. A year’s work on this case, which was a structure of great intricacy, had been performed by the interrogators. In 1938, however, it became known that Kossior himself had been arrested as a Trotskyite. Everyone thought that the students would be released. But a new interrogation immediately started, and they were beaten up for having lied to the NKVD. After a few days, the stool pigeons in the cells let them know what they were supposed to confess this time. It was to change their deposition, putting the name of Kaganovich for that of Kossior. The NKVD could not face the trouble of constructing a completely new fabrication. Finally everything was in order, and the students were sent off to labor camps. A Ukrainian court recently named Kosior, Chubar and Postyshev among eight individuals personally responsible for the Holodomor. * When Kosior was assigned to Moscow in 1938, he was replaced in the Ukraine by a good friend: future Soviet Premier Nikita Khrushchev. (According to Nikita’s son.) To judge by the ferocity and extent of the purges Khrushchev oversaw, he took to heart the lesson from his predecessors’ fall. 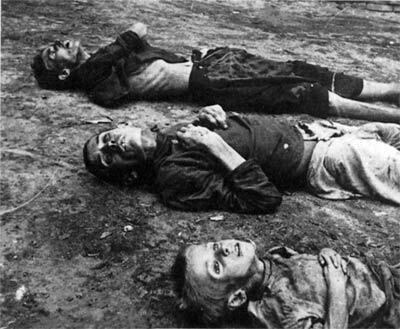 † The nature of the Holodomor is the subject of furious present-day wrangling: can the mass starvation accurately be classed as a “genocide”? Especially given that such a finding could expose Russia and/or Russians to legal liability, there’s something of a difference of opinion on the matter between Kiev and Moscow. The fact that you feel a need to ask such a question tells me the very same corrupt ideology is still prospering. Need some English lessons, dear?